The conductor on the train back from London today didn’t come round to check tickets until just before Hove. Two stops before home. As the train pulled into Hove station, I was still fumbling in my coat pockets trying to find my ticket – always a suspicious sign to an experienced conductor I’m sure. As he went off to open the doors, the conductor promised to return. And the sideways stare he kept on me as he backed off to the control box was a clear “I’ve got my eye on you, sonny”. As an example of Great British Officialdom, if he’d pulled off his mask to reveal the round face of the late, great Arthur Lowe I wouldn’t have been shocked. Chance would, of course, make a mildly awkward situation into an all out embarrassment when he returned. My tickets were proudly on display before me, but now I was on the phone – believe it or not because Tamsin had called in a panic to tell me her brakes had just failed pickling Tabitha up from her gym class. Not meeting conductor’s eye, pretending to be involved in a serious conversation… I must have appeared as cunning as The Artful Fare Dodger. I describe the set up because, naturally, there was a problem with my tickets. I’d booked them for the wrong day. A slip of the mouse on the Southern Rail website booked me a standard class single on the 16.17 from Victoria to Shoreham for Wendes hte 22nd September, not today. However genuine my “oh my goodness, you must be joking. What a silly mistake’-like response was, of course, the comedy shock expression on my face only confirmed the conductor’s belief that I was a hardened criminal try to ride the £5 fare for free. My pleas of a geniune mistake (true) and “I haven’t got any means of paying for another fare” (false) fell on deaf ears. I even had the difference between a return fare and an advance single less than patiently explained to me. 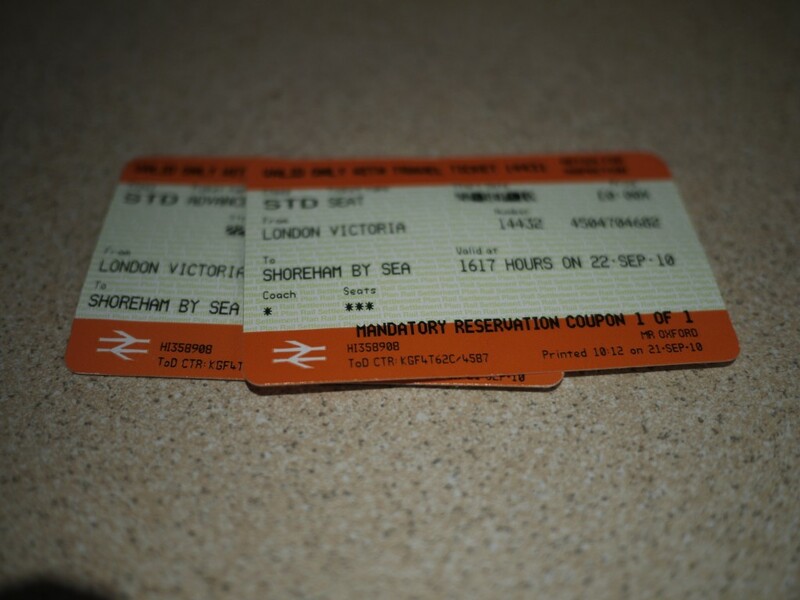 Fortunately, the train was now fast approaching Shoreham, and there were a lot more tickets to check. “I’m going to trust you to do this, but when you get to Shoreham, go to the ticket office and sort out paying the full fare”. Right. Obviously I was going to do that. Once let off the train I’d be out of the station and back to my – rather upset by the brakes failing – wife just as fast as I could without arousing the attention of the railway police. Right? I’m sure that’s what the conductor thought, and had resigned himslef to letting one get away. But I called his bluff. As much because I was genuinely curious as to what their reaction would be to someone handing themselves in as because I had a guilty conscience about it (and figured that I’ll almost certainly see that conductor next time I get on a train). I did go to the ticket office. I did the Right Thing. I told the staff there. I can still hear them laughing from here.